The Low Down: Adam Wilde is a wreck. He should be happier than he’s been in his whole life – his band, Shooting Star, is huge; he’s in L.A. dating a gorgeous actress; he’s living the dream. But truth be told, he never got over Mia. After an amazing recovery, she gets to attend Juilliard just like she always wanted to. Adam didn’t figure that he’d never see her again. Turning his pain into gold, Adam writes some of the best songs ever. At first, the adulation, the awards, the crowds, the groupies – they’re all great. Then once the novelty wears off, he is again confronted with emptiness. He’s short tempered, anxious, fighting with his band. He can’t wait for the latest tour to be over so he can hole up somewhere and ignore everyone. Then three years later, fate intervenes while he is finishing up some work in the New York City. Will Adam finally get a chance to find out why Mia walked away so he can finally move on? Best Thang ‘Bout It: I love that this Part 2 is told in Adam’s voice. This has to be his story, since he is the one left brokenhearted and alone. There can’t be just a couple of paragraphs about how devastated he was/is; it has to permeate the story so we can understand how he’s gotten to where he is today (both career-wise and personally). True to the original book, this one is also told with many flashbacks. That brings the two volumes together even though they are different stories. I said in my review for If I Stay that “Adam is the best soon-to-be-a-rock-star boyfriend ever found in print.” I still stand by those words. This is a person who went through something horrible in the first book only to think he got through the worst of it. He made a request and found that he could not live with the outcome. As for Mia, she is not the baddie in this tale; far from it. She has a lot of questions herself and has to live with being the survivor when she wasn’t even completely sold on surviving in the first place. The most important question now is: does she want to survive or live? I just love the writing style. It quietly fills your heart and lungs and tear ducts and soul and takes up residence. Since this time it’s in Adam’s voice, the tenor changes and he speaks like a guy would speak. (I mean man). It definitely makes it more realistic. I’m Just Sayin’: Maybe I steeled myself for this one, but I think it was only a 3 tissue book this time around. I know the story is over, and really, it could have gone either way. It’s not really decided until the very end…and you know it’s the right decision. To Read or Not To Read: There’s real-time angst and closure, flashback happiness and devastation. And you know you need closure. So get on it. 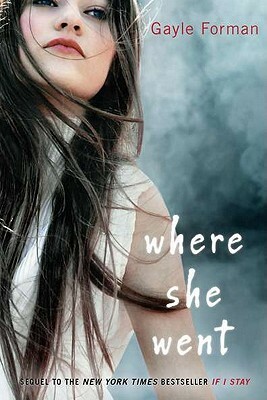 Where She Went by Gayle Forman was published April 5, 2011 by Dutton Juvenile. not enough time for so many great books! They’re both so good. They way the original story is told is very unique, I think. Worth squeezing into your schedule for sure!